Im not so much in to measuring ingredients, I tend to just chuck things in and hope for the best, but I will try my hardest to give correct quantities. I have two kids so I made 12 omelettes, if you have just 1 child and wont be eating any yourself, just adjust the recipe as needed. A bigger child will easily eat 2 of these. The mini omelettes will keep nicely in a box (with lid) in the fridge for 5 days, I make a batch on Saturday evening to last the week. oil for the pan and for frying. -Spray or brush your muffin tin with oil. -Cut your onion in to fine squares, for adults you can use rings, but my kids aren’t to keen on onion so I like to make it small, it gives nice flavour and they wont even notice its there! -In a bowl, crack your eggs and whisk it together with the milk. I use very little milk, just enough to make it easier to whisk. Add a pinch of salt. 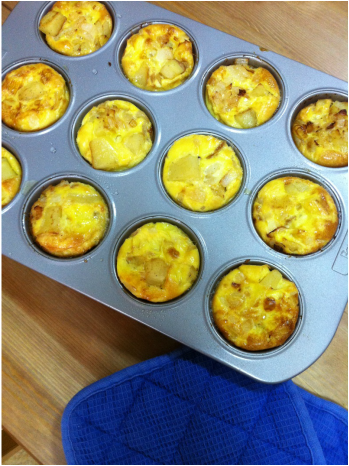 -divide the egg mix in the muffin tin, the eggs will rise so each ‘cup’ shouldn’t be more then half full. Pop it all in the oven. Your mini omelettes are done when they are all ‘set’ and have a bit of colour to them. Takes 20-25mins or so (you can bake them for less time, but if they are to runny they will not keep for 5 days as they will release to much moisture and get soggy). 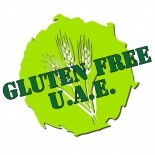 This entry was posted on 06/10/2012 by glutenfreeuae in Lunch Boxes, Recipes and tagged breakfast, glutenfree, kids, lunch, lunch box, lunchbox, school lunch.